Memorial plaque carved 1918 Church of St John the Baptist, Ouse . Who was Nellie Payne? 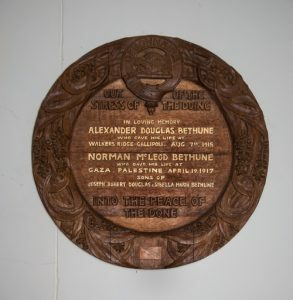 BETHUNE.— Killed in action at the Dardanelles, Corporal Alexander Douglas Bethune, 8th Light Horse, eldest son of the late J. R. Douglas Bethune, of Tasmania, aged 35 years. BETHUNE.—Died of wounds in April, in Egypt, Norman McLeod Bethune, second beloved son of the late J. R. D. Bethune of Cluny, Ouse.